Lauded for heralding in the “new Italian design” movement (i.e. hypermodern innovations on classics), Capasa has always been known for his architectural precision in draping men’s and women’s necks, hips, and shoulders with impeccably tailored suiting, trench coats, and casualwear in body-hugging leathers, silk knits, and denim. And currently, The Fashion Pulse, an online boutique offering blends of upscale emerging fashion designers with established fashion designers, is offering 70% off on a number of Costume National clothing, shoes and handbags. It's not a big range on sale but these fashion pieces are gorgeous and at 70% off, there's some good buys here. There are a number of items on sale that I really like. The Caramel brown Costume National boot shown here is hot. 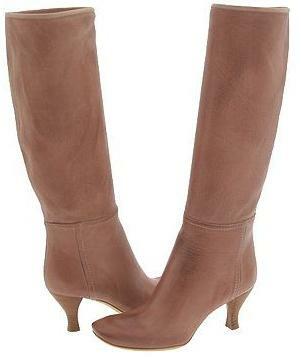 These must-have boots are made in Italy from 100% Leather with wooden soles and have 2 3/4" heels. There's also some Costume National shoes included in this sale. The Costume National Black Peep Toe Pumps with 3" heels and the Costume National Brown leather strappy sandals are worth a look. Another fab item is the Italian made and designed, large, signature "Butterfly" Costume National handbag. This Buttery-soft leather bag has a large roomy interior and includes a zipper pocket and 2 interior pockets for cell phone, keys, etc. It has a zipper pull closure and the exterior features two hidden flap pockets with snap closure. Measuring about 20" long, 7 1/2" wide and excluding the handle, about 11" high from zipper to bottom, this Costume National bag fits comfortably on your shoulder. The handle connects to the bag with 2 silver 2" diameter rings with the name "CoSTUME NATIONAL" clearly engraved. The bag is made from 100% Leather and is fully lined in nylon with the words CoSTUME NATIONAL. It's hot at 70% off! There's also a medium signature Butterfly Costume National bag on sale. While the range of items on sale at The Fashion Pulse is rather limited, don't despair as I also found great prices on Costume National designer fashion at a number of other fashion retailers. The online boutique YOOX for example, has an awesome range of Costume National designer fashion on sale and for designer shoes, the online shoe retailer Zappos currently has some great prices and is worth a look. Last but by no means least, as well as Costume National's own stores such as the ones in New York and Los Angeles, if you want to spoil yourself good and proper with the very best in designer fashion then Bergdorf Goodman, one of the BEST department stores in NYC is a great place to wander around aimlessly looking at top designer fashion. The atmosphere at Bergof's is oh so very chic! The Chanel, A Christian Dior, Gucci, Prada, Oh I'm in heaven. However, bargains don't come often at Bergdorf's. But it does have great sales.